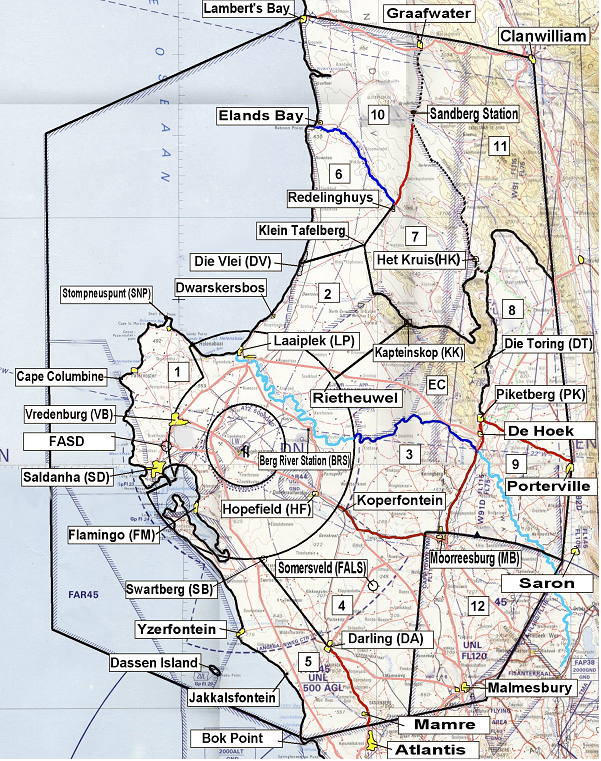 The sections below detail the agreement between SAHPA and Airforce Base Langebaanweg (FALW) regarding the flexible use of FAR45 and FAD46 airspace. Please link to the official agreement for the exact wording. The text on this page serves as a friendly overview only. Please do not abuse FALW airspace or the concessions that they have kindly granted us. A chunk of the Atlantic Ocean connecting Lambert’s Bay and Bokpunt. Applications have to be submitted for any flights that are made from within or approach 10km of 45/46’s outer boundaries. If we stick to the above the no reply from FALW means that we are cleared for take-off. At weekends and public holidays we have automatic clearance for flights east of the Piketberg, Koringberg mountain line up to 3000m AMSL. Flights from Koringberg to Elandsbay are restricted to 1500m AMSL. Daily clearance procedures still apply to take off sites and flights east of Piketberg and Koringberg as they are too close to FALW ATZ for automatic clearance. Flights made outside of the concession zone outlined above also require pre-flight clearance requests. FALW may at any time close the airspace to gliders at their own discretion.